I have been rather fortunate, via a friend, to score a freebie ereader – Amazon’s Kindle. I’ve been wanting an ereader to play with for a long time. Admittedly, based on what I’d seen and played with so far, the Sony models seemed to be the best on the market. Regardless, I reckon the kindle is a good introduction to e-ink. A friend has recently bought and reviewed the kobo. At $200, the kobo is still a little pricy for my liking, and the kindle is closer to $230 (having just dropped in price substantially) to get it delivered from the US. There has been recent news that the Sony readers might finally be available in Australia later this year. I’ve got a Kindle 2 (US version, not international) which means a 6 inch screen with a mini qwerty keyboard. I needed to get the original owner to deregister it on their account so that I could register on my Amazon account. Amazon wouldn’t let me buy ebooks for the kindle until I had a valid kindle registered. I could have downloaded Kindle for PC but that would have gone against the purpose of having a dedicated ereader. To date, I have been unsuccessful in getting the wifi to work; consequently the only way to purchase books from Amazon is to select my computer as a download option and then transfer them from the computer to the kindle via USB. So far, that’s no great drama and is akin to my print buying experience…except that I don’t have to wait a week or so to get the book. Instant download is a win. For me at least right now, I don’t need wifi access to order books. I can see why it would be useful but I don’t particularly see it as a valid tool for assessing an ereader. Ultimately ereaders should be about how well they handle the text – ie how well they function as a container. 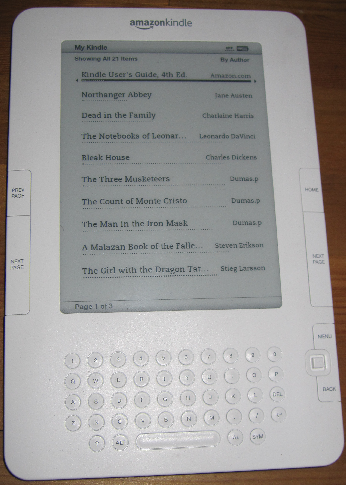 For fiction reading, as far as I can tell, most ereaders are going to be similar so long as they’re using e-ink. E-ink is fantastic for reading books and I love the look of it, the feel of it, and how comfortable it is on my eyes. I am a lot happier reading an e-ink screen for several hours than I am using a computer screen. For the benefits of giving the kindle a proper workout, I bought a proper book from Amazon as a test case. That book (mistyped that as “ook” – I am such a librarian) was The Girl With The Dragon Tattoo by Stig Larsson. I’ve been meaning to read this for ages anyway ie it was a book I wanted to read. One of the annoying things with e-ink, and this is a side effect of the current state of play for the technology is that you get a sort of raster effect every time you change page. It’s a harsh, jarring experience but it’s a problem that I’ve seen with all e-ink devices. With that said, I adjusted to it as I read the novel and by the end it didn’t matter – it was sort of like the electronic version of the interruption of turning the page. We’ve adjusted to not being able to read books continuously in print but in reality, print has a similar sort of experience: turning a page can be a disruptive experience to the flow of text. Especially if our fingers slip and we turn two pages instead of one; advancing two pages results in a rather confusing muddle til it eventually dawns and we backtrack and re-read. With that said, the act of “turning the page” is important, regardless of the container. I considered whether being able to scroll down the chapter (as if it were a webpage) would be useful and decided that would be too jarring an effect. That is of course, jarring in the sense of a lifetime of reading standard anglo books. I would like to say that the experience of using the kindle has meant that I’m more likely to read (as I think has been commented elsewhere) but the reality is that I continue as much as I am in the mood to read. I did read, initially, more often, using the kindle but I suspect that relates more to a sort of “new toy syndrome” – I have a kindle and thus I want to play with it. As I progressed through the novel, which was riveting and enjoyable, I kept going not so much because of the device, but because of my desire to see how the story unfolded. By the end, I was almost oblivious to the container and it was the content (how is this going to end?) that ruled the day ie the container did not interfere with my experience of its content. That’s a big plus for the medium as far as I’m concerned. Hmmmm…this was supposed to be a simple review of the kindle…oh well, it has gone to interesting places at least. One of the things I liked about the kindle was that it was very easy to read one hand and had a “next page” button on both sides of the device so that I could read it one handed: left or right. Screen updates are generally slow as you change pages but that’s not kindle specific. The keyboard is annoying and I have no interest in it – it gets in the way; I would like a smaller kindle if I could have it without the keyboard. In terms of reading a book, new habits need to be developed in terms of assessing progress. In print, you know which page you’re up to, and how many to go. Similarly, it’s relatively easy to work out how far it is to the end of the section, or the end of the chapter. Those visual cues that are part of my print reading experience don’t quite exist with the ebook. The kindle does give me a % so I can at least tell that I’ve read 23% and thus have 77% to go. That solves the problem of the physical sense of the thickness of the book and how far along the bookmark sits. For the kindle at least, there does not seem to be an easy way of assessing how far to the end of the chapter: if it’s 5 pages I’ll keep going, but if it’s 25 pages, I’ll stop for now and go to bed. Battery life rocks. Weight rocks. The big reason I want an ereader is for travel. I have carried 1000 page novels for long, international flights and then bought additional sized novels for return trips. That is heavy and consumes serious space…not to mention factoring in the other books I buy while away – which is usually double figures. For the near to longer term at least, there will always be lots of books to buy in print, some of which will be very special to own in print. However for day to day reading, mass market paperbacks, casual fiction, etc…I just don’t care! The container is irrelevant. If I can load up an ereader with a bunch of books I like to read then that’s a win. I was able to read all of my test novel without recharging, indeed, I should be able to get a couple of weeks out of a single charge. That would actually be enough to cover my next international trip: fly Sydney to Mexico, hang around a week or two, fly home. It’s potentially doable on a single battery charge though I will charge it in Mexico just to be sure. But I will be able to load it with a few chunky novels (in fact I have done so with the next two in the series of 1,000 page epics – Tales of the Malazan by Stephen Erikson) and not need to buy casual reading material. Of course, that will probably mean I have more space to buy other sorts of books I encounter on my travels – that sounds sort of good, sort of bad. As a friend likes to say “a little bit of column A and a little bit of column B”. Being able to squeeze in a few more desirable acquisitions is generally a plus I think. My overall general sense is that the kindle is a little klunky and doesn’t represent my ideal ereading experience. I have used a couple of other devices, notably the original Sony ereader (PRS-505) and regard the Sony as a superior device. Oddly, Sony seems to have the most open device on the market. The kindle is very restrictive and only allows content to be transferred via wifi, or direct from the computer via a special USB cable (not USB at kindle end). The kindle has its own DRM based format though it supports .mobi files generally as well as AZW, ASCII and PDF. The Sony also supports ePub (kindle doesn’t) which some folk reckon is the emerging standard for ebooks. Importantly for me, the kindle does not allow you to plug in your own memory cards ie I’d like to be able to swap files in and out independently without connecting to a computer. The Sony does support SD. One of my concerns is that the files downloaded from Amazon are kindle specific ie they are tied to the devices I have registered with Amazon. This would be problematic if, or when, I get a new device eg a Sony or a Kobo, and thus wouldn’t be able to transfer the ebooks I’ve bought from Amazon to the new device. My sense of ownership is somewhat different to that of a book ie in the case of the kindle, I own the book so long as I want to read it on a kindle. As near as I can tell, if I want to read the ebook on a different ereader, then I no longer own it. While I believe there are tools for converting the DRM kindle ebook to a more open format, I am somewhat offended that I would need to do so in order to transfer content I’ve paid for between containers. Amazon breaks the division between content and container just a wee bit as their content is tied to their container. According to the wordpress editor, I’ve just passed the 1,700 word mark and I still have so much to say :-) This has probably been less a review of the kindle and more a review of the ereading experience. There are other kindle specific things I may well comment on later, such as the difficulty of getting a cover and my less than satisfactory experience so far with the new upgrade. Overall I’m happy enough with my kindle as a basic ereading device, it sets a good standard and delivers an acceptable reading experience. For now. Interesting. I found I wanted to touch the screen to do things on the Kindle and it was a strange disconnect to have to press buttons. Do you have other touch devices? Nothing I have at the moment requires screen touching so it’s not a disconnect for me. My need for touch may well be different should I ever get a smart phone :-) With that said, I’ve never been fond of touch pads on laptops either. My fingers are usually too clumsy. Hi Barry, yeah, I’d be waiting if I was looking to buy. The kindle price drop was only in the last few days and is unlikely to be the only one. Officeworks are even selling ereaders now including one for $129. However they reckon it only gets 7 hours battery life. It has a 5″ screen but it does take SDHC. Haven’t played with it yet. Great post! I’m hoping to get my hands on an iPad but don’t want to fork out the dough. Might be able to wangle one somehow – should find out soon. I love the touchscreen, since I have an iphone. I actually bought the same book as you to read on my iphone kindle but as a reading experience it was a bit frustrating having to turn the page so often. At the moment it’s all I’ve got though… desperate for an ereader of some kind.